The mix of force and sensitivity makes it a valuable statement in a difficult time. Laura Burhenn, the force behind the Mynabirds, has turned political before (on 2012's Generals), but her new album feels different. Be Here Now came together in just a couple weeks of recording after this year's presidential inauguration and the next day's Women's March in Washington, DC. Burhenn had plenty to say, and she got it down quickly. This summer, the album came out as a series of EPs before being properly collected in its full format. While the scattershot feel of the release diminishes its effectiveness a bit, the mix of force and sensitivity makes it a valuable statement in a difficult time. The line gets to the heart of Burhenn's work. She's not advocating violence; in the context of the rest of the song, the conflict in the line comes out. Yet seeking for peace in a dangerous world doesn't always result in the hum of meditations. Other feelings flicker, and honest recognition of them reveals something. Even if Burhenn isn't looking to throw punches, she's not in favor of sitting back and waiting for moral justice to work itself out. 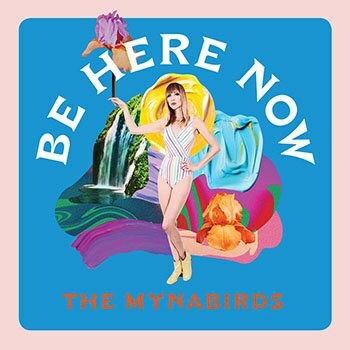 Opener “Be Here Now” calls listeners to unity, providing the album's anthemic core. When she sings, “Everybody stand together / Everybody stand your ground,” she shows her stance of resistance. There's a community that she wants to gather. It's one that can “sing real loud” and stand shoulder to shoulder, drawing strength from each other. The statements themselves each work, but the music's shifts can be odd. Burhenn may have Bowie in mind in her approach to the disc, but her changes from torch singer to new wave to indie pop to '80s pop and so on don't quite cohere. It fits the burst of thought and emotion that drive the record, and it allows her to do something complex, but the seams show. The Mynabirds' last release showed Burhenn to be a “Wildfire", an artist in energetic exploration, and that excitement continues here, even if it doesn't succeed as much. The key pieces of the album -- “Be Here Now”, “Golden Age”, and “Shouting at the Dark” -- are important works delivered at just the right time. Burhenn's a vital artist with much on her mind and array of styles at her command. In that sense, Be Here Now builds on her career-long work of thinking both personally and politically, of both controlling and unleashing her strength. That approach also reveals itself as just a bit of weakness here, but Burhenn's welcoming personality and willingness to simultaneously dance and resist prove enough to carry the disc (and possibly the day).